Based on prevailing open surgical principles, the technique of laparoscopic ice slush for renal hypothermia was first described by Gill et al. (3) from the Cleveland Clinic Foundation. They reported their technique in 12 patients, with a mean tumor size of 3.2 cm (range, 1.5-5). Mean depth of invasion into the parenchyma was 1.5 cm (range, 0.7-2.5). Of these, two patients had a solitary kidney. A transperitoneal approach was used. A 5 French open ended ureteral catheter was inserted cystoscopically and positioned in the renal pelvis. The renal artery and vein were circumferentially mobilized en bloc, without any attempt to individually dissect the vessels. The kidney was completely mobilized within Gerota's fascia, maintaining the perirenal fat over the tumor. Laparoscopic ultrasonography was now performed to delineate the tumor and circumferentially score the proposed line of resection around the tumor, including an adequate margin of healthy tissue. Mannitol (12.5 g) was administered intravenously and a Satinsky clamp was positioned around the intact, en bloc renal hilum without closing its jaws. Sterile ice slush was created in an ice slush machine and constantly stirred manually to reduce it to a fine consistency. Five 30 cc syringes were modified by cutting off the nozzle end of the barrel. They were prefilled with ice slush in preparation for rapid injection. The 12 mm inferior pararectal port was removed and a 15 mm Endocatch II bag inserted through the same skin incision. The bag was opened and carefully positioned around the kidney. The drawstring was pulled, thus, detaching the bag and deploying it around the kidney. The disengaged metal ring of the bag was removed from the abdomen and the inferior pararectal port was reinserted. The drawstring was further cinched with extreme care taken to avoid any trauma to the renal vein and artery. Typically, the drawstring cannot be synched completely, requiring placement of hem-o-lock clips to snug the mouth of the bag gently around the intact renal hilum. Thus, the kidney is completely enclosed by the bag. The jaws of the Satinsky clamp were then securely closed around the renal vessels taking care not to include any part of the bag in the jaws. The bottom end of the bag was grasped with locking Allis forceps inserted through the inferior pararectal port. This port was removed, delivering the end of the bag outside the abdomen, where it was secured with a hemostat. The port site skin incision was extended by only 2-3 mm and the peritoneal fascia was similarly incised. Pneumoperitoneum was desufflated and the exteriorized end of the bag was cut open. Using the previously loaded syringes, 600-750 cc of ice slush were rapidly inserted into the bag, thus, completely surrounding the kidney with ice. The opened end of the bag was closed with a tie, the bag reinserted into the abdomen, a 10 mm balloon cuffed blunt tip cannula secured at this port site and pneumoperitoneum was restored. Laparoscopic visualization confirmed that the kidney was properly surrounded by ice slush within the bag. A laparoscopic sponge (4 X 18 inches) was positioned around the bag to prevent bowel from coming in direct contact with the ice filled bag. After approximately 10 minutes the bag was incised and the ice slush removed from around the tumor site only, leaving the ice in contact with the remainder of the kidney surface. Laparoscopic partial nephrectomy was then completed in the standard fashion. In the Cleveland clinic series, the median time to deploy the bag was seven minutes (range, 5-20). A nadir renal parenchymal temperature of 5°C to 19.1°C was achieved in the five patients in whom renal parenchymal temperatures were measured using thermocouples. Concomitantly, median systemic esophageal temperature decreased by only 0.6°C. Median total ischemia time was 43.5 minutes and total operative time was 4.3 hours (range, 3-5.5). Median hospital stay was three days (range, 2-7). Intraoperative complications occurred in two patients.0 In one, the kidney was not fully mobilized, and the ice slush filled bag partially slipped off the kidney. In the other, part of the bag was caught in the jaws of the Satinsky clamp resulting in inadequate occlusion of the renal pedicle and a 500 cc blood loss during resection of tumor. Postoperative radionuclide scanning confirmed function in the operated kidney in each instance, although with various degrees of resolving acute tubular necrosis. For the whole group, mean preoperative serum creatinine was 1.1mg/dL. Mean peak serum creatinine was 1.5 mg/dL an average of 1.2 days after surgery and nadir serum creatinine was 1.2 mg/dL an average of 2.8 days after surgery. Potential shortcomings of this technique include space limitations to deploy and engage the bag in the retroperitoneal approach, significant perinephric adhesions that may preclude complete mobilization of the kidney, and the theoretical possibility of systemic hypothermia. The authors concluded that adequate renal cooling can be achieved by purely laparoscopic techniques and the additional studies are required to develop a more efficient ice delivery system. Wakabayashi et al. (4) recently described a technique for renal hypothermia using ice slush during retroperitoneal laparoscopic partial nephrectomy. They reported their experience in two cases. The renal tumor size was 1.3 cm and 9 mm, respectively. A 6 French pigtail catheter was inserted into the renal pelvis cystoscopically. 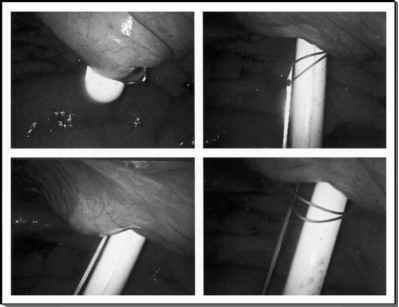 A standard retroperitoneal approach was then achieved using a balloon dilator and four trocars. The renal artery was mobilized and vascular tape placed around the renal artery. The kidney was completely mobilized. The primary port site incision was then extended and a cylindrical cannula was then inserted into the retroperitoneum. Ice slush was then introduced through the cylindrical cannula into the retroperitoneum. The device was removed and the skin incision narrowed with a suture. The balloon port was then secured into the retroperitoneum. The ice slush was then evenly distributed over the kidney using an Endo Retractora, and Mannitol administered intravenously. A laparoscopic bull dog clamp was placed on the renal artery. Pneumoperitoneum was restored after 15 minutes of cooling. Laparoscopic partial nephrectomy was then completed. In these two cases, the total operative times were 214 and 233 minutes, respectively. Cold ischemia times were 81 and 47 minutes. Nadir renal temperature was 18.4°C and 25.8°C. The systemic temperature decreased by 0.8°C and 0.6°C, respectively. A total of 1500 cc and 1200 cc ice slush was introduced, respectively, mean time of 10.5 minutes to insert the ice slush. Postoperative isotope renal scans showed good function in the renal remnants. There were no complications. The concern with this technique is the potential for uneven cooling of the kidney due to uneven application of the slush over the entire surface of the kidney. Also any inadvertent peritoneal entry may compromise bowel integrity.